Jezebel is a culture hero in the struggle against the suppression of diversity and perpetration of female enslavement. For thirty years, almost 3000 years ago, Jezebel moved her nation toward justice and appreciation of women, minorities and diverse spiritual practices. Her life reminds us that we must free ourselves from the ET Nibirans’ woman-suppressing attitudes, miscegenation Nibiru’s King Anu, Earth Goldmining Expedition Chief Enlil (designated as “Yahweh” until 2025 BCE when Enlil’s nephew, Marduk claimed the Yahweh title), Yahweh’s rivals Allah (Nannar) as well as Popes and fundamentalists of all stripes have inflicted upon us. Jezebel reminds us to accept our essential oneness as humanity. Pop culture has morphed Jezebel as a whore. But historically, this did not mean she was promiscuous. She wasn’t. She was a whore as far as Yahweh was concerned, because she tolerated in Israel devotion to other Anunnaki instead of only him. I am grateful to Leslie Hazelton for this magnificent Jezebel, the book on which this broadcast relies, we see Jezebel was an enlightened queen, urging humanity toward a more civilized civilization. Click graphic and hear the show. In 1003 B.C., Israelite leader David captured Jerusalem. 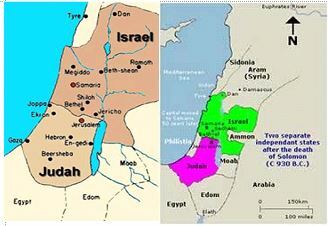 Then, in 931 B.C., when David’s successor, Solomon, died, Abraham’s descendants split their turf into the kingdoms of Judea in the south and Israel, bordering Phoenicia–land of the great Canaanite traders of the old world–on the north. Until 910 B.C., Jeroboam, Rehoboam, Abijah, Nadab, Baasah, Elah, Zimri, then Omri ruled Israel. In 872 B.C., the leading Phoenician, Ithbaal, King of Tyre, a descendant of Enki and Inanna, sealed an alliance with Israel. 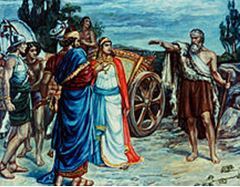 Ithbaal gave his daughter Jezebel to AHAB, the successor to Omri as King of Israel. Jezebel descended from both the Enkiite clan (led now by Prince Marduk) and the Enlilite clan, led by Enlil Anunnaki Commander Enlil. She could naturally bridge the rival Enkiite and Enlilite factions. Jezebel came to a magnificent temple of Astarte/Inanna Ahab build for her in Samaria, north of Jerusalem. She traveled with servants, traders, emissaries of Tyre, 400 priestesses and 450 priests. When Ahab defeated an Assyrian attack, ELIJAH, Yahweh’s representative in Israel, blamed Jezebel for Ahab’s decision not to sacrifice the captured Assyrian king and his men to Yahweh and instead create an alliance with Assyria. Yahweh and Elijah wanted Ahab and Jezebel deposed and killed. Elijah created a challenge: Yahweh’s priests and Jezebel’s would see whose cattle sacrifice Yahweh would accept on Mt. Carmel. Yahweh, of course, accepted his priests’ bull but rejected the bull of Jezebel’s priests, whom the witnesses then, at Elijah’s insistence, killed. Jezebel, furious, exiled Elijah; he fled Israel. Yahweh took Elijah aloft in his aircraft (but told ELISHA, Elijah’s successor as Prophet of Yahweh that he killed Elijah). Elisha engineered another Assyrian attack, in which Ahab was killed. Then Elisha suborned HAZAEL, Ahab’s Chief of Staff. Yahweh had Hazael murder the King of Assyria. Hazael then made himself ruler of Assyria. He made a deal with the generals of Israel and Judea (Judea was now ruled by the son of Jezebel and Ahab) to murder the rulers of both Israel and Judea. 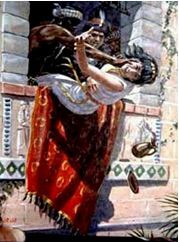 Hazael made JEHU (a descendant of Zimri who’d assassinated Israel’s king Elah before Ahab’s father Omri killed him) King of Israel and had his men throw Jezebel to her death from her second story to be torn apart by mastiff dogs. 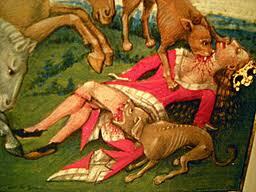 “The morning after Jehu’s triple regicide, Jehu consolidated his power. He ordered every male in any way related to the House of Ahab’s father Omri,” King Joram’s counselors and priests, fleeing attendants of Jezebel trying to get back to Tyre seized and beheaded so blood would be the hands of all surviving authorities. Tyre and Judea, the latter now ruled by Jezebel’s daughter ATHALIAH, cut relations with Israel so the Syrians easily subjugated Jehu and Israel, left Israel with only peasants to keep growing food, deported 500,000 soldiers, priests, scribes officials and craftsmen of Israel (the ten tribes of Israel that were “lost”) to other parts of the Assyrian empire and replaced the deported Israelis with settlers from other parts of the empire [Jezebel: 93-197].